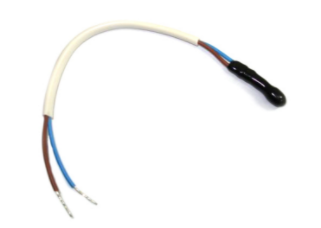 Temperature Sensors are available to wired tracking devices that have the 1-Wire data input (the LMU 2630, TTU2830, LMU 4230 and more). On most devices, this uses the same wire as Driver ID Reader, so the two are not compatible together. 1. The blue input on the temperature sensor needs to be connected directly to the blue/white wire on the tracking device. 2. The brown input on the temperature sensor must be connected to chassis ground or to the black wire (ground) on the tracking device. The temperature supplied will come from the thermometer end of the sensor, so if the supplied sensor/wiring is not long enough to locate it in an ideal spot, a standard electric wire can be used to extend the reach.